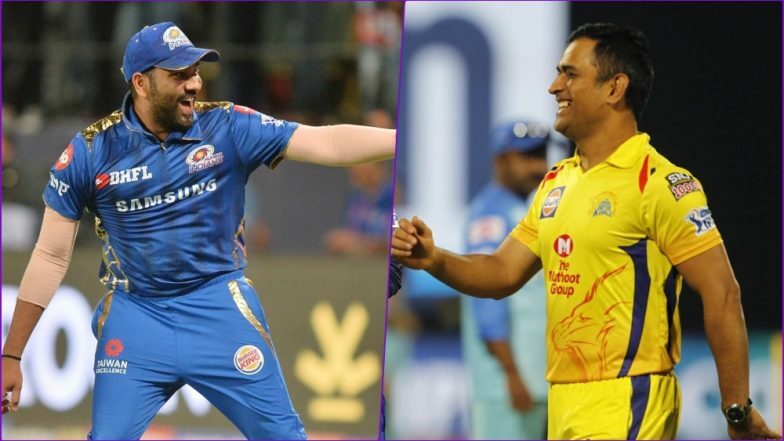 MI vs CSK Head-to-Head Record: Ahead of IPL 2019 Clash, Here Are Match Results of Last 5 Mumbai Indians vs Chennai Super Kings Encounters! The Mumbai Indians (MI) and the Chennai Super Kings (CSK) have had some memorable encounters in the past for supremacy both in the Indian Premier League (IPL) and the now-defunct Champions League (CL). It will not be wrong if we refer to MI vs CSK clash as the El Clásico of the league. They have history, titles and most importantly a lot of fan following. This brings us to MI vs CSK head to head record. The two teams have met each other 26 times with Mumbai winning 14 games and Chennai bagging 12 games. In VIVO IPL 2019, Rohit Sharma’s Mumbai side are seventh in the points table and have a tough job at hands stopping the juggernaut of the Dhoni’s top-ranked Chennai. Before their next clash, here’s a look back at the last five games between Mumbai Indians and Chennai Super Kings. CSK vs MI, IPL 2019 Match 15 Preview: Chennai Super Kings Favourites Against Mumbai Indians in Clash of Titans. Suresh Raina’s 75 helped Chennai Super Kings helped reach 169/5 batting first, but they could have got another twenty runs had the lower order contributed more. The likes of Dwayne Bravo and Sam Billings got out cheaply to hand the initiative to Mumbai. They chased won the total with ease with the top three of – Suryakumar Yadav, Evin Lewis and Rohit Sharma all performing well. Mumbai Indians Squad in IPL 2019: Team Profile, Schedule of MI in VIVO Indian Premier League 12. The inaugural game of the 2018 Indian Premier League was a thriller with the heroics of Kedar Jadhav winning the game for Chennai right at the very end. Earlier Mumbai Indians has set a target of 166 for the visitors to win. Hardik Pandya and Mayank Markande picked up three wickets each to stifle Chennai, but Dwayne Bravo’s 68 coupled with Jadhav’s grit won them the game. CSK Team in IPL 2019: Schedule and Squad Analysis of Chennai Super Kings in VIVO Indian Premier League 12. Mumbai Indians won the final of 2015 IPL in spectacular fashion as both their batting and bowling units delivered on the big stage. Lendl Simmons blasted 68 and skipper Rohit Sharma chipped in with a fifty to take Mumbai past the double hundred mark. In reply, Dwyane Smith played a lone hand with 57 as CSK folded for 161. Mitchell McClenaghan was the pick of the bowlers for Mumbai with three wickets. Mumbai Indians did well with the bat scoring 187/6 in the first innings with Lendl Simmons top scoring with 65. Keiron Pollard hit 5 sixes in his 17 ball 41 which was crucial in the middle phase for the home side. For Chennai, it was a story of players not converting their starts to big scores which is needed to chase down big scores. Lasith Malinga’s spell of 3-23 was the turning point of the game. Chennai Super Kings batting could not change gears and were restricted to just 158 in their innings despite all the batsman reaching double figures. Ravi Ashwin did try to bring CSK back in the game with a brace, but the score was just not competitive enough to defend. In the end, Hardik Pandya and Ambati Rayudu got Mumbai home. So, it’s been one-way traffic in favour of Mumbai Indians in their last five battles with Chennai Super Kings which is good to hear if you are a Mumbai fan. It should be an intriguing game in Wankhede which could be a visual treat even for the neutrals.